The idea that magical creatures inhabit our world fascinates children. 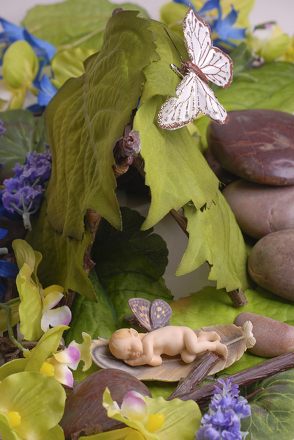 And what better way to nurture your child's imagination than by making a fairy house out of materials found in nature! Like DIY in miniature, this activity calls upon your child's creativity and problem solving skills, while also getting him out in nature. This activity works best in a wooded area with lots of different kinds of leaves, twigs, underbrush, grasses, and other natural materials. Try to find a unkept setting full of fallen tress, stumps, and overgrown bushes. Bring nothing but yourselves (and possibly a camera) into the woods with you. The point is to make a fairy habitat using only what you can find in the natural world. Find a spot for your fairy dwelling. Remember fairies prefer to live where they cannot be seen. Fun fact: Do you know that when people "knock on wood" it harkens back to the belief that fairies lived in trees and liked to cause mischief? If you knocked on the wood of the tree, the fairies wouldn't be able to hear your wishes and concerns. Fallen trees with hollowed centers, nooks underneath bushes, and tight corners between large rocks make great living quarters for a fairy. Your child could also make a tent-like structure with a few large leaves. What is this fairy's primary occupation--collecting nuts to sell to squirrels, documenting the wishes of humans, collecting things that humans leave behind in the woods? What does the fairy like to do for fun--knit, cook, read, build things? What does the fairy eat? Does the fairy have any pets? Who are the fairy's friends and family? Does she live alone? What is the fairy's name? The answers will help to determine what kind of living situation the fairy requires. If this fairy is a forager, she'll need plenty of storage space. If she documents wishes, she'll need a desk. Now it is time to search the forest for materials that can serve as decoration, furniture, plates, silverware, etc.. Anything you find is fair game, even if it's a candy wrapper or a bottle cap. Unfortunately, this is a realistic part of the forest floor. 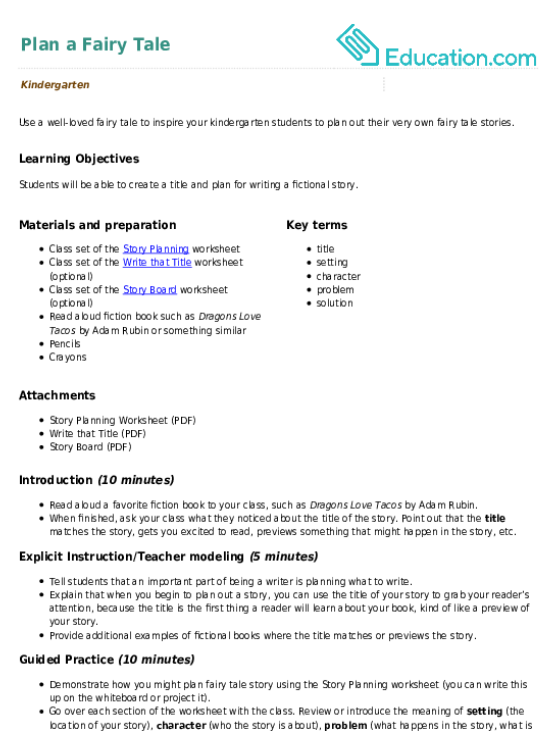 Bring your collections back to the site and get creative! Encourage your child to imagine that she's only two inches tall: what would she want to sleep on, cook with, and do for home entertainment. After your child is done, have her explain all the various features of the fairy dwelling. In a few days, go back to that location-- has anything changed? 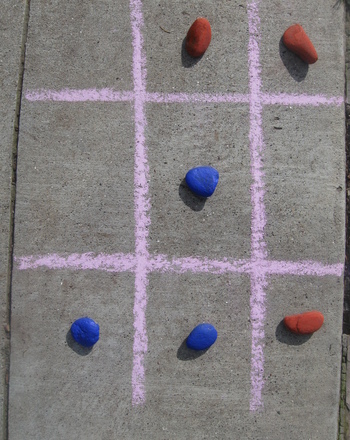 This is a memorable activity that provides the creative play crucial your child's development. 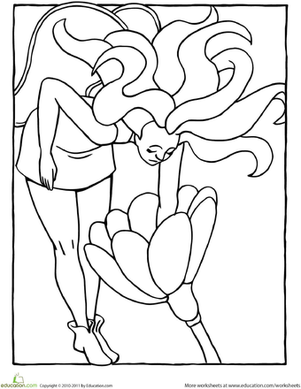 Featuring a pretty nectar fairy, this coloring page is sure to make your child's day. Make your kindergartener's day with this fun enchanted swamp fairy scene, complete with enchanted crocodile! Need an assist with Tooth Fairy duties? Look no further! Try these printable notes, ready made just for your little one. Let your child live out her fairy fantasies by putting together her very own fairy paper doll. 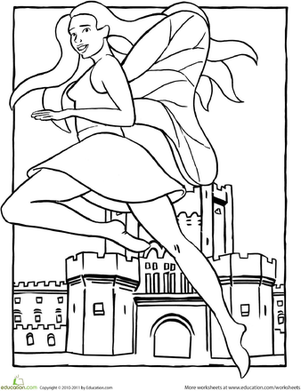 Little girls are sure to have a blast coloring this pretty fairy fluttering outside a fairy tale castle. 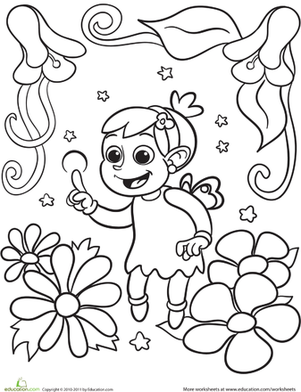 This fun coloring activity of a tennis-playing fairy will nurture the future tennis player/fairy in your child. Here is Cinderella's best gal pal, the Fairy Godmother, transforming an ordinary pumpkin into a magical carriage with a wave of her magic wand. A sports...fairy? That's right! 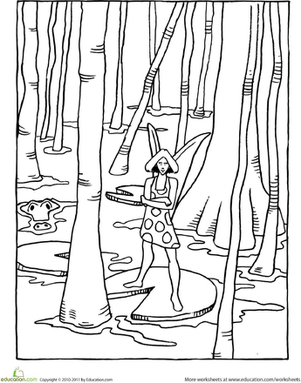 Add a little whimsy to your kid's coloring routine with this golf club toting fairy known as Graceful on the Green. 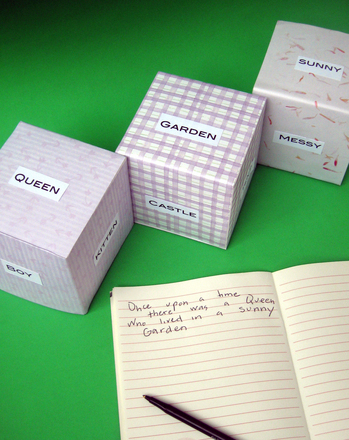 Use a well-loved fairy tale to inspire your year one students to plan out their very own fairy tale stories.